Craymond is a character in Splatoon 2. He is a emperor shrimp who operates the headgear shop Headspace along with Flow. Craymond sits on top of Flow's large red hat. He is a small shrimp, with the entirety of his body being of peach tan color. In contrast to Flow's calm demeanor, Craymond is anxious and quick to jump at things. After Flow finishes talking, he will blurt out words just like Moe with Annie, albeit being much less rude. "I REGRET EVERYTHING." - When the player enters the shop before reaching level 4. "I ACCEPT YOUR SPIRIT." - When the player does not have enough Cash to purchase an item. "SMELL YOUR MODEM!" - When the player is offline. "DON'T BE STRANGE." - When a player exits the shop. "YOU DID IT!" - When the player enters for the first time after reaching level 10. "MAGNIFICENT" - When the player enters for the first time after reaching level 20. "YOU HAVE EYES!?" - When a player tries to a buy a headgear they already have. "SOORT VAN SORRY!" - (KIND OF SORRY!) - When the player enters the shop before reaching level 4. "GAMBOOOOOO!" - (CRAYMOOOOOOND!) - When the player at level 4 or higher enters the shop for the first time. "LEKKER, HOOR!" - (NICE!) - When the player at level 7 or higher enters the shop for the first time. "JE RUIKT OOK JAMMIE!" - (YOU SMELL YUMMY TOO!) - When the player at level 10 or higher enters the shop for the first time. "KIJK JOU ‘NS GAAN!" - (LOOK AT YOU GO!) - When the player at level 13 or higher enters the shop for the first time. "LEKKERE VERSE AURA!" - (NICE FRESH AURA!) - When the player at level 16 or higher enters the shop for the first time. "INKTDRUKWEKKEND!" - (INK-PRESSIVE!) - When the player at level 20 or higher enters the shop for the first time. "..." - (...) - When a player enters the shop the second time after any of previous instances. "SUPERVISKEURIG!" - (SUPER FISH-NICKY!) - After the player chooses whether to equip a new item. "GEESTIG. MAAR NEE!" - (WITTY. BUT NO!) - When the player has not enough cash to purchase an item. "HAD JE AL!" - (YOU ALREADY HAD!) - When the player selects an item they already own. Emperor shrimp are known to form symbiotic relationships with sea slugs, similar to Craymond's relationship with Flow. 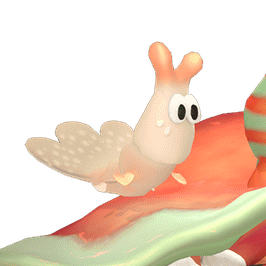 According to the relationship chart posted by Nintendo, Craymond and Murch have some form of history together. All that is known is that Murch seems to think positively of Craymond, while Craymond seems to regret his history with Murch. This page was last edited on 27 March 2019, at 06:23. This page has been accessed 24,777 times.